Stefan Bosse, Armin Lechleiter, A hybrid approach for Structural Monitoring with self-organizing multi-agent systems and inverse numerical methods in material-embedded sensor networks, Mechatronics, (2016), DOI:10.1016/j.mechatronics.2015.08.005. One of the major challenges in Structural Monitoring of mechanical structures is the derivation of meaningful information from sensor data. This work investigates a hybrid data processing approach for material-integrated Structural Health and Load Monitoring systems by using self-organizing mobile multi-agent systems (MAS), and inverse numerical methods providing the spatial resolved load information from a set of sensors embedded in the technical structure with low-resource agent processing platforms scalable to microchip level, enabling material-integrated real-time sensor systems. The MAS is deployed in a heterogeneous environment and offers event-based sensor preprocessing, distribution, and pre- computation. Inverse numerical approaches usually require a large amount of computational power and storage resources, not suitable for resource constrained sensor node implementations. Instead, the computation is partitioned into spatial off-line (outside the network) and on-line parts, with on-line sensor processing performed by the agent system. A unified multi-domain simulation framework is used to profile and validate the proposed approach. 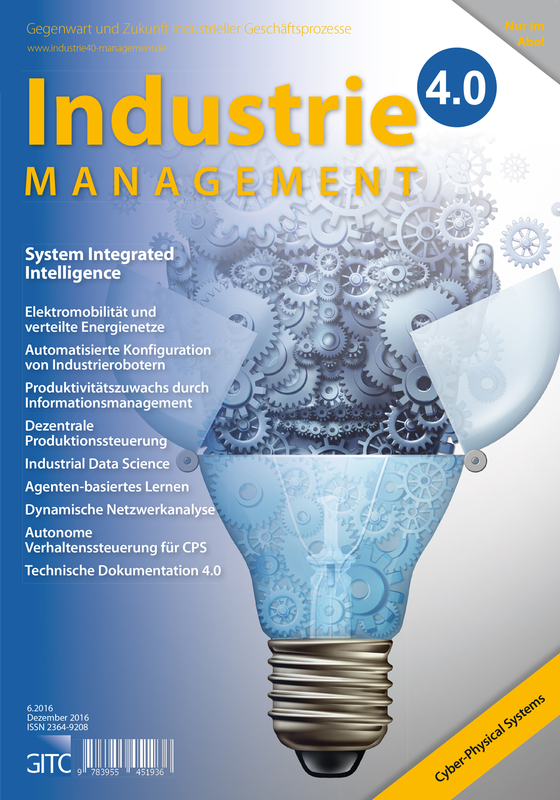 Stefan Bosse, Industrielle Agenten und Agenten-basiertes Lernen im technischen Kontext, Industrie Management, 6/2016. Datenverarbeitungsprozesse werden immer komplexer hinsichtlich der Datenmenge, Datendimension, und dem Zusammenhang der abgeleiteten Informationen mit den Eingangsdaten. Dieses wird bei sensorischen Messprozessen besonders deutlich, wo Messunsicherheiten, Kalibrierungsfehler, und Unzuverlässigkeit von Sensoren signifikanten Einfluss auf die Informationsgewinnung haben. Gerade im technischen und industriellen Kontext stellt die zunehmende Komplexität und Verteilung der Datenverarbeitung ein zunehmendes Problem dar. Häufig stehen hinter der Informationsableitung mathematische Modelle und Funktionen, die aber nicht immer vollständig sind. Geht es um die Gewinnung von Zustandsaussagen eines Systems oder um Adaption, können Lernverfahren eine Alternative darstellen. Traditionell werden Messdaten zentral gesammelt und ausgewertet. Es soll aufgezeigt werden, wie verteiltes Maschinelles Lernen mit mobilen Agenten und selbst-organisierenden Systemen einen signifikanten Beitrag zur Verbesserung der Datenverarbeitung in technischen und industriellen Systemen leisten kann, dieses sowohl hinsichtlich der Qualität der Aussagen von Schlussfolgerungen, der Effizienz, als auch der Robustheit. Dieser Beitrag soll einen Überblick der verschiedenen Teilbereiche Lernen, Agenten, und Architekturen geben. Stefan Bosse, Industrial Agents and Distributed Agent-based Learning, 3rd International Electronic Conference on Sensors and Applications . 15-30 Nov. 2016, MDPI, 2016, DOI:10.3390/ecsa-3-S2004. Today sensor data processing and information mining become more and more complex concerning the amount of sensor data to be processed, the data dimension, the data quality, and the relationship between derived information and input data. This is the case especially in large-scale sensing and measuring processes embedded in Cloud environments. Measuring uncertainties, calibration errors, and unreliability of sensors have a significant impact on the derivation quality of suitable information. In the technical and industrial context the raising complexity and distribution of data processing is a special issue. Commonly, information is derived from raw input data by using some kind of mathematical model and functions, but often being incomplete or unknown. If reasoning of statements is primarily desired, Machine Learning can be an alternative. Traditionally, sensor data is acquired and delivered to and processed by a central processing unit. In this paper, the deployment of distributed Machine Learning using mobile Agents forming self-organizing and self-adaptive systems (self-X) is discussed and posing the benefit for the enhancement of the sensor and data processing in technical and industrial systems. This also addresses the quality of the computed statements, e.g., an accurate prediction of run-time parameters like mechanical loads or health conditions, the efficiency, and the reliability in the presence of partial system failures. Dirk Lehmhus, Stefan Bosse, Self-adaptive Smart Materials: A new Agent-based Approach, 3rd International Electronic Conference on Sensors and Applications . 15-30 Nov. 2016, MDPI, 2016, DOI:10.3390/ecsa-3-S2005. Load-bearing engineering structures typically have a static shape fixed during design based on expected usage and associated load cases. But neither can all possible loading situations be foreseen, nor could this large set of conditions be reflected in a practical design methodology— and even if either was possible, the result could only be the best compromise and thus deviate significantly from the optimum solution for any specific load case. In contrast, a structure that could change its local properties in service based on the identified loading situation could potentially raise additional weight saving potentials and thus support lightweight design, and in consequence, sustainability. Materials of this kind would necessarily exhibit a cellular architecture consisting of active cells with sensing and actuation capabilities. Suitable control mechanisms both in terms of algorithms and hardware units would form an integral part of these. A major issue in this context is correlated control of actuators and informational organization meeting real-time and and robustness requirements. In this respect, the present study discusses a two-stage approach combining mobile & reactive Multi-agent Systems (MAS) and Machine Learning. While MAS will negotiate property redistribution, machine learning shall recognise known load cases and suggest matching property fields directly. Stefan Bosse, Distributed Machine Learning with Self-organizing Mobile Agents for Earthquake Monitoring, IEEE 1st International Workshops on Foundations and Applications of Self Systems (FASW), SASO Conference, DSS Workshop, 12 September 2016, Augsburg, Germany, 2016, 2016, DOI:10.1109/FAS-W.2016.38. Stefan Bosse, Armin Lechleiter, Dirk Lehmhus, Data evaluation in smart sensor networks using inverse methods and artificial intelligence (AI): Towards real-time capability and enhanced flexibility, Proc. of the CIMTEC, - 7th Forum on New Materials, Perugia, Italy, June 5 to 9, 2016, 5th International Conference Smart and Multifunctional Materials, Structures and Systems, 2016, 2016, DOI:10.4028/www.scientific.net/AST.101.55. Data evaluation is crucial for gaining information from sensor networks. Main challenges include processing speed and adaptivity to system change, both prerequisites for SHM-based weight reduction via relaxed safety factors. Our study looks at soft real time solutions providing feedback within defined but flexible, application-controlled intervals. These can rely on minimizing computation/communication latencies e.g. by parallel computation. Strategies towards this aim can be model-based, including inverse FEM, or model-free, including machine learning, which in practice bases training on a defined system state, too, hence also facing challenges at state changes. We thus introduce hybrid data evaluation combining multi-agent based systems (MAS) with inverse FEM, mainly relying on matrix operations that can be partially distributed: The MAS perform sensor data acquisition, aggregation, pre-computation, and finally application (the LM/SHM itself and higher information processing and visualization layers, i.e., WEB interfaces). System capabilities are evaluated against a virtual test case, demonstrating enhanced stability and reliability. Besides, we analyze system performance under conditions of in-service change and discuss system layouts suited to improve coverage of this issue. (C) 2006-2019 Dr. Stefan Bosse.